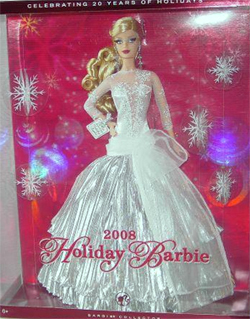 2008 Holiday Barbie celebrates the 20th Anniversary of Holiday Barbie Dolls. Available in Caucasian and African-American versions, she is wearing a glittery gown with a dropped waist and tiers of pleated silver lame. with white tulle accents. 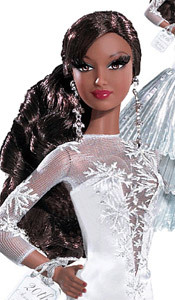 She is is the first in the current holiday Barbie series to have rooted eyelashes! She has long silver drop earrings and her long hair is pulled back. The packaging features Christmas ornaments and snowflakes against a red foil background with suspended snowflakes in the package. She was designed by Sharon Zuckerman and is wearing the same dress in her 2008 Christmas DVD - "Barbie™ in a Christmas Carol". There is also a 2008 Hallmark Holiday Barbie Ornament. Visit Barbie and Friends - a Social Network for Barbie Collectors from around the world. Get the Vintage Barbie and Fashion Doll Blog widget and many other great free widgets at Widgetbox!